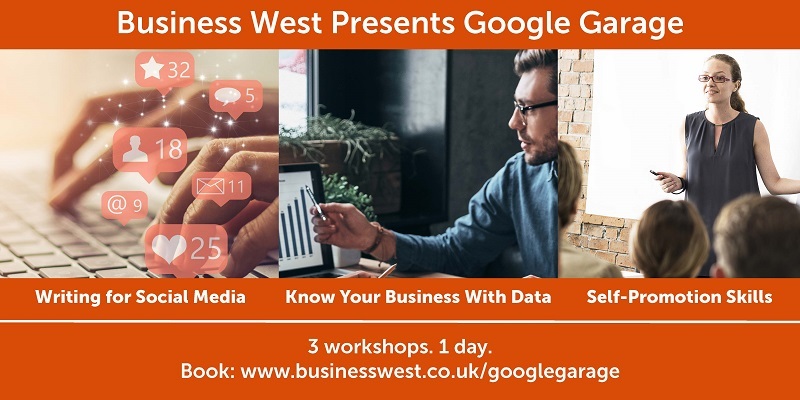 Skills West, a project delivered by Business West, is teaming up with Bristol City Council and Google Digital Garage to bring a series of free training workshops to Bristol, as part of Digital Cities Bristol 2018. Taking place on Wednesday 28th November, these workshops are certified by Google and aim to enhance your business and professional skills. Ideal for small business owners, anybody looking to enhance their skills or change their career. Three workshops will be held throughout the day and you can choose to book onto one, two or all three! With social media growing and playing a key role in the way businesses now communicate with their customers, it’s important to learn how to adapt your writing for a variety of digital platforms including Facebook, Twitter, Instagram and YouTube. During this workshop you’ll learn how to create content with confidence across key social platforms, whilst discovering how to define your brand and tone of voice. Data is a hot topic at the moment and if used in the right way, can help you to understand your customers and the way they behave. Book your place at this workshop to learn how analytics can help you uncover trends about your customers, learn the value of insight-based marketing and discover how interpreting data correctly can help your business grow. At this workshop, discover the importance of self-promotion in your careers and learn how to start developing this skill. Places are limited at these events, so don't miss your chance to get taught by the experts.